Neck pain, or cervical pain, is a common condition that affects many Americans at some point in their life which can be caused by a number of problems. There are many conditions of the spine that can be responsible for neck pain. Conditions such as herniated discs, spinal stenosis, and pinched nerves can commonly cause cervical symptoms. Conservative treatment methods are usually first used to help treat symptoms, however, surgery can be necessary if the underlying problem is unresponsive to non-surgical treatment. If you are experiencing cervical symptoms, contact the pain management specialists at ProMedSPINE to schedule a consultation. Recognizing and identifying the severity, frequency, type, and location of the pain is very important information to be shared with the physician. Any specifics help the physician make a complete and accurate diagnosis and can help ensure proper treatment. Injuries – Car accidents and sporting injuries can cause trauma to the structures in the neck. Whiplash is a well-known injury that can result from car accidents. To learn more about neck pain, please visit WebMD. Depending on the condition, there are several non-surgical treatment methods that may be utilized. Our experienced back doctors will always first attempt to treat neck pain with conservative treatment options like physical therapy programs, exercise, rest, and medications. Certain steroidal injections can also be administered in certain cases. Conservative options can often be effective for treatment. When conservative, non-surgical treatment is ineffective in reducing suffering, there are many surgical procedures that may be performed. If symptoms are unresponsive to non-surgical treatments, it may be the result of a spinal or nerve condition that requires surgery. When pain cannot be managed, the condition must be properly treated. Cervical painfulness can cause severe discomfort along with a host of other problems and limitations to daily life. You should not have to suffer through these. If you are experiencing troubling neck pain in Los Angeles, contact ProMedSPINE today. Our back doctors work with each individual case to find the best available treatment options for the highest probability of lasting success. 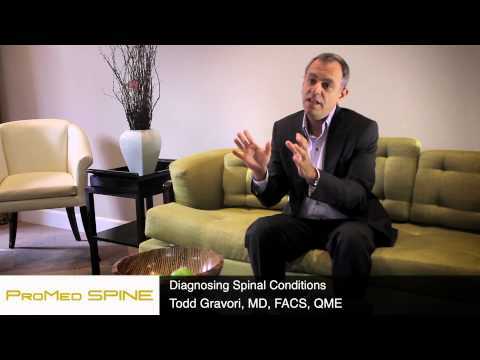 Todd Gravori, MD, is the director of ProMedSPINE. Each back doctor at our spinal practice is a board-certified neurosurgeon with fellowship training in advanced spine surgery and treatment. At ProMedSPINE, we take pride in offering the most sophisticated technology and cutting-edge minimally invasive spine procedures to provide the highest quality of care for our patients. To schedule an initial consultation, please contact us today! Next, learn about leg pain.